Image represents Brass Finish model. This Sprinkler Head is actually Chrome Plated. 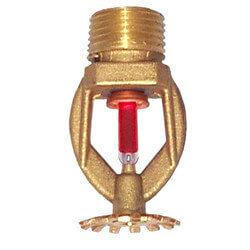 The Globe Quick Response GL Series Sprinklers are a low profile yet durable design which utilizes a 3mm frangible glass ampule as the thermosensitive element. This provides sprinkler operation approximately six times faster than ordinary sprinklers. While the Quick Response Sprinkler provides an aesthetically pleasing appearance, it can be installed wherever standard spray sprinklers are specified when allowed by the applicable standards. It offers the additional feature of greatly increased safety to life and is available in various styles, orifices, temperature ratings and finishes to meet many varying design requirements. Quick Response Sprinklers should be used advisedly and under the direction of approving authorities having jurisdiction. The heart of Globe's GL Series sprinkler proven actuating assembly is a hermetically sealed frangible glass ampule that contains a precisely measured amount of fluid. When heat is absorbed, the liquid within the bulb expands increasing the internal pressure. At the prescribed temperature the internal pressure within the ampule exceeds the strength of the glass causing the glass to shatter. This results in water discharge which is distributed in an approved pattern depending upon the deflector style used.. Note: This product should be used in stand-alone Fire Protection systems only. It is not lead free, and should not be in contact with the potable water supply.